Installing landscape elements (trees, shrubs, perennials) and hardscape elements (patios, walls, outdoor kitchens) around your home is just the tip of the iceberg when it comes to creating an aesthetic and functional landscape. It is the Grading and Drainage work that occurs before any installation that can be the most important! 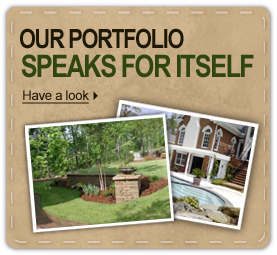 Keeler Landscapes recognizes the importance of this key element and knows that the needs of each home will vary. With our experienced and knowledgeable staff, we strive to provide a landscape that will be sure to shine for years to come! What does Grading and Drainage consist of? Not sure? Read below or check out our Portfolio for great examples of the Grading and Drainage services Keeler Landscapes can provide for your home! Drainage Systems: Used for the collection of surface water and usually consists of catch basins and downspout collection pipes. These catch basins and pipes are all tied into a single main pipe, which empties at a lower elevation. French Drains and Channel Drains can also be tied into this type of system. Channel Drains: Used to collect water as it flows down or across driveways, patios, and walkways. These drains are usually embedded or installed in concrete or pavers and will be covered with a grate. French Drains: Designed to remove water away from the foundations of buildings, behind retaining walls, and wet areas of a yard by allowing it to seep into a drain field and be piped away. Waterproofing: Most commonly used on foundation walls and retaining walls. Waterproofing is used to prevent water to permeate through a wall and usually used in conjunction with a French Drain and Drainage Mat.